In the late 1980s I began in earnest to teach myself to paint with watercolor. Not knowing where else to begin, I went to our local library and checked out a book on beginning watercolors and from there learned three things that have really made a difference: First, use only good quality rag paper; second, use only good quality brushes and third, and most important, this book made me aware of the connection between watercolor painting and drawing. Previously I had tried to approach watercolors much in the same way I painted with oils, and for me it just didn’t work. Now it’s nearly thirty years later I still have much to learn. My first and still favorite means of artistic expression is drawing with a ‘plain ole #2’ lead pencil. When my head finally made the connection between watercolor painting and drawing, I was finally able to achieve some degree of success with watercolors. The emphasis of my early training was on abstract design. This training has been found especially useful in my realistic style, as I tend to see my overall compositions in terms of abstract design. I majored in art at Concord College in the mid 1960s. There I concentrated on drawing and oil painting. I took a one semester class in watercolor painting only because it was required, and received the only “C” I ever made in a studio drawing or painting class, and that was a gift. As far as I was concerned this was an impossible medium and for over twenty years I never once considered trying watercolors again. Then sometime around 1985, from out of the blue the thought came to me to teach myself to paint with watercolors. To this day that one ill-fated class in watercolor at Concord has been my only formal instruction in the medium. On March 11, 2008 I suffered a major stroke which paralyzed the whole right side of my body. A rather unhandy occurrence for a right-handed artist, to say the least. Nearly one year to the day I completed my first painting since the stroke, Housetops Burford England. While I do not wish to slight the work of many wonderful medical personnel who attended to me, the doctors, nurses, technicians, ambulance drivers and medivac helicopter team, physical therapists, I must say it is only by the grace of God that I am still here today, much less once again able to paint. And in such a short span of time. For any degree of success I have attained as a watercolorist, the love and support of my family has been foundational. First, the love of my life and wife of fifty years, the mother of our three sons, Gloria has been my principal supporter. An accomplished pianist, organist, quilter and jewelry maker in her own right, without her encouragement most of my paintings never would have happened. I am also grateful to my three sons, Russ, Mike and Ryan; my daughter in law, Esperanza and last but certainly not least my three grandchildren, Izabelle, Joseph and Joaquin. God has not only blessed me with a wonderful, loving and supportive family but a wonderful, loving and supportive extended church family as well. I serve as Assistant Pastor at Calvary Chapel in Princeton, a non-denominational Christian movement in fellowship with Calvary Chapel Outreach Fellowships of Costa Mesa, CA. 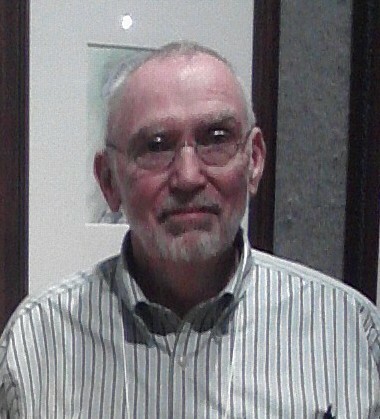 Past member of the Beckley Art Group, Appalachian Artist Association and the Mahoning Valley Watercolor Society, and have exhibited with all three organizations. I have held one-man shows at the Chuck Mathena Center, Princeton, WV; Sister's Coffeehouse, Princeton, WV; Carrington's Cofffeehouse, Bluefield, WV; Neighbors Arts and Crafts, Princeton, WV and the Payne Gallery, Bluefield, WV., Carnegie Hall, Lewisburg, WV. Various first, second, third, honorable mention and best of show awards from Appalachian Artist Association and Mahoning Valley Watercolor Society shows.